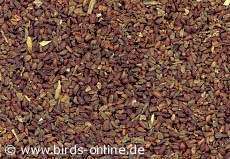 There are many plants in Central Europe that produce seeds which are edible for pet birds such as budgies. One of these plants is the well known evening primrose or Oenothera biennis. Shortly after the flowering season the tiny dark brown seeds develop. Some retailers who offer food for parrots sell these seeds which are fairly expensive. It is also possible to look for the seeds outside in nature. Many small pet birds, including budgies, like the taste of these seeds once they have become used to it.